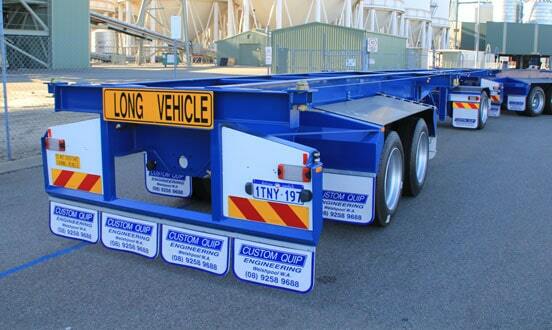 Custom Quip Engineering is one of WA’s top trailer hire companies. Boasting custom designs and top-tier maintenance services, our personalised customer service and quality equipment make us one of the most trusted manufacturers in the region. Custom Quip is an Australian trailer manufacturer with two decades of combined experience in building, maintaining, and renting trailers throughout Perth. We have an extensive line up of both new and used trailers, including both steel and aluminium grain trailers, skel trailers, dollies, side tippers, and much more. We also build custom trailers in Perth, which are fully tailored to any customer’s needs. Our workshop is capable of producing anything from heavy transport trailers to agricultural trailers. We work in close coordination with our clients, providing them with direct access to our manufacturing personnel. Our privately-owned business is carried out with a hands-on approach by a sole owner and skilled engineers. Our services include a whole host of products that can be purchased directly, hired, or even acquired through a ‘hire to buy programme’. We service our products directly without going through a third party. Any time you receive support from us, you’re taking full advantage of our expertise. And while we fix your trailer, we can even provide you with a rental vehicle during the build process. Our manufacturing workshop in Welshpool features 18 bays and a fit-up workshop ready to serve any build orders or any trailer repairs in Perth. We also employ in-house services for sandblasting and painting. We have an array of trailers and grain tippers available for sale in our fleet, all of which are 100% Aussie made and built to weather the conditions of the northern regions. Our wide variety of trailers for hire include well-maintained and serviced tipper trailers, loaned out at a competitive rate. We don’t just sell trailers—we fix them right up as well, and make sure that they’re in proper working order. Custom Quip Engineering’s sandblasting processes are safe and effective ways of removing buildups of rust and dirt that could hamper performance and even lead to corrosion. Finally, we offer reliable, professional, and cost-effective repair solutions through a comprehensive suite of fleet maintenance services with full warranty support. Contact us for a free quote now and find out how we can help you deliver your loads! Our unique selling point is a combination of being an established privately-owned business with a “hands on” sole owner that can make dynamic business decisions coupled with an unrivalled package that consists of a suite of road transport and agricultural equipment products for hire, buy or hire to buy. As expert Australian trailer manufacturers, we are the experts you can trust. We don’t rely on an agent to service and repair your trailer and can support you with a rental vehicle during the build process. If you like our rental equipment then we can arrange a hire to buy arrangement. CQE Manufacturing – 18 Bay fabrication and fit up workshop offering full design and build range of agricultural machinery and heavy road transport trailing equipment. CQE Blast & Paint – In-house grit blast and paint booths offering a repair service from a bent guard to a full rebuild/refurbish. CQE Parts & spares – Drawing from our extensive stores, we hold in stock most common trailer parts to get you back on the road.